Walking in France it’s very easy to tell when you are approaching the next town. There’s always just one steeple in center of town that’s the highest point and visible from a mile away. Approaching Laon, this typical city layout, is, quite literally heightened. Laon is built around a stunning early gothic cathedral on a massive hill. After my long hot walk yesterday, I stayed in a hotel closer to the road on the outskirts of town. It worked perfectly to end yesterday, but I woke up on a mission to see the upper city and the gothic cathedral. I walked about a mile into town and easily followed the signs to the gothic city. The hard work was climbing the municipal stairs with my backpack! It was a cause for wonder, though, after viewing the cathedral I wondered if all the rock and labor that went into climbed the same mountain. I took some pictures with the outside of he cathedral using my trusted method of asking someone armed with professional camera gear. I was blown away to step into the church and see it was actually heavenly; bright, open, beautiful, with only gold and colorful stained glass accenting the fortress of white marble. A recording of choir music, something like Handels, echoed through the sanctuary, I took a deep breath and walked closer to the alter. Along the sides of this otherworldly space were ordinary, volunteer-made informational posters like you might see in any church, however, these were particularly interesting because they explained the pilgramages that pass through the cathedral. I loved mixing my experience and research of the pilgrimages with my still forming french vocabulary to try to understand what each panel meant. After some time observing the silence, I floated into the streets to find lunch, and came back to earth over a cheap and filling meal of turkish kebab! Oof! As I ate, I found myself wondering if hunger headaches were in fact, a real medical ailment or something invented by my grandmother. In any case, the little headache I woke up with was not going away with lunch, or the liter of water I was drinking. I climbed down the stairs to the lower city and started to walk towards the direction of my next town, but I just did not feel well. I knew if I started walking and felt too sick to continue, I might not be in a town for many miles, so I was reluctant to get on the road. I had another coffee for a chance to sit and revise my plans, but it was inconclusive. I found the train station and tempted myself at the counter by asking how about the next train to Reims. I learned my two days journey could also be achieved in two hours. I ducked into a bookstore, then a Spar Grocery store, and finally had to face the rain with my hood up and raincover over my backpack for the first time. I didn’t want to climb back to the old city to find a hotel, that was ground I had already covered for the day. So, actually, I did not really want to take the train to Reims except maybe to fall asleep on it. I walked away from the station in the rain and ate the apple I just bought, a new species, from its soggy paper bag. I felt so calm. I didn’t know what would happen next but I just knew it would be OK and I was excited for whatever was around the corner. As it turned out, in a few blocks I approached the back of a building marked “Hotel” for deliveries. I hadn’t seen that before. I wondered if it was in fact, connected to an operating hotel on the other side, so I scurried around the corner to explore. I dialed the number and stood in the sheltered door. My phone connected to Daphne but I suddenly remembered I couldn’t really speak French. While I was still on the phone, a young couple hopped out of a taxi with their luggage and joined me waiting outside the hotel door. I took my phone off my ear. “Do you speak French?” I asked them and handed over my phone. They were from the Caribbean island of Guadalupe, which apparently is still French and very tied to the economy here, they were traveling on business. l felt very curious when I realized they were maybe first people I think I’ve met from Guadalupe, even though it’s much closer to New York than Laon! While we waited for Daphne I was happy to make their acquaintance and exchange details for their future trip to New York, or mine to Guadalupe! And when I reached the room, I felt so happy to be out of the rain, and to find a place that was simple but sparking clean. I learned later the hotel opened just one month ago! I took a Tylenol. I took a shower that didn’t feel like a chore. By the time I was feeling better, my friend, the same one whose parents had me for dinner when I was lost in Picardie, messaged me, oh, also my friend in Laon, is an English teacher, a girl like you age 28, and would you like to meet her for dinner while you are in the city? And in the end, I didn’t lose a day to feeling ill at all, I gained a friend over “cheese soup” (a welsh!) the best thing of all! I am slowly remembering more French words as I journey deeper into the countryside. Tqoday I recalled the useful phrase « long chemin » from a pop song (Mon Pays by Yelle). From Wissant, I travelled through Marques, missing Guines all together, and joined back up with the path later to end in Licques. As I realized this, I thought of renaming my blog “Via Francigen-ish” for all the times I’ve gotten lost and made it on a parallel path. It was a very good day. It began in a fog, quite literally, because of the weather, and figuratively, I did not have coffee when I left the hotel! Most of the way to Licques is rural farms. Marques is bigger, with at least 3 supermarkets on the outer part of town. At one of them I learned what I wanted was called a « café chaud » but supermarché offerings vary, so I settled for an energy drink. In the supermarket, I asked for directions towards Wisques. Somewhere in this half French, half English conversation, I recalled a French phrase which was apparently comprehendible « J’ai besoin de courir tout le jour por quoi est un long chemin ». And, apparently the energy drink worked. As I traveled on, the fog lifted (in my mind at least) and I was perfectly happy to sing to myself the song that taught me the words I needed today. I carried on for hours this way through green fields and gray skies, practicing my French on cows I passed, thinking of new songs and picking wildflowers. I found myself stopping in the post office of a little village Rinxent, just because I was excited to see people and churches for a change of scenery. I got a stamp from the clerk, and the crisp circle a star and the. name of a new place gave me a boost and made me feel I was really moving forward, however slowly. By noon, I felt pretty hungry, but the countryside was still sparse, so I knew the whatever the next available option was would be my choice. I was excited to come upon a cluster of white arrows in Hardinghen , including one with the magical words « boulangerie » and another, bless up, « cafe »!! I walked through the city center eating my tarte aux pomme out of the paper. Skip this part if you’re hungry- I’ll just describe it as fresh and flakey on the outside, with farm made apple sauce spilling out the inside. I paused the one other possibly open establishment in town, « Chez Fanny » as I was wiping apple sauce off my face. A cheery older woman with an adorable Yorkshire terrier was smoking outside. I don’t remember what I managed to ask in my poor French, but it didn’t matter, because I think we both were just happy to have someone to chat with. I spent about a forty minutes having coffee with her as she bought losing lottery tickets and we both adored her little dog. 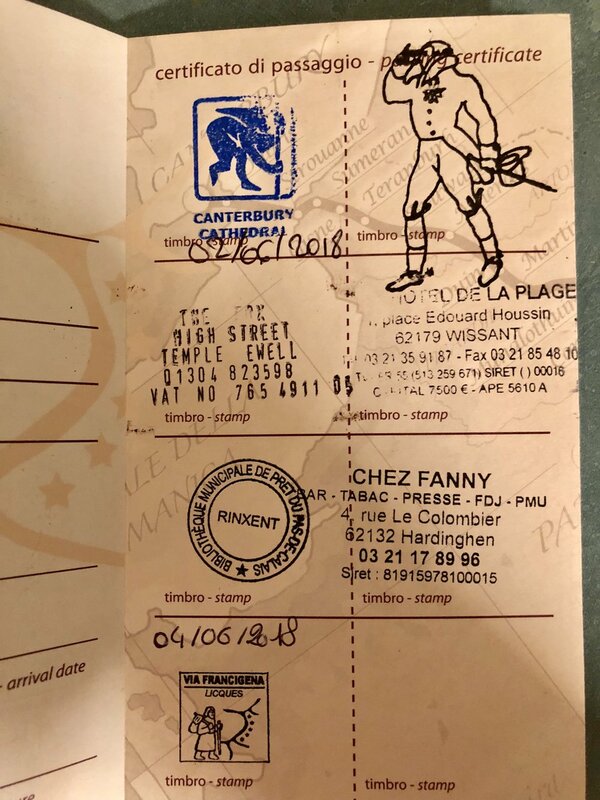 And my second stamp of the day at Chez Fanny was an important reference point for figuring out which of the three villages; Hardinghen, Herbinhhem and Hermelingham I had passed as I headed towards Licques. From Chez Fanny on, I felt quite full and confident going forward. There were lots of rolling hills towards Licques, but no matter, it was up and over. When I arrived in town, the very efficient tourist office stamped my pilgrim passport, xeroxed no less than 4 full color pages of maps for me, drove me to the campsite and went inside with me to translare to the office I wanted to rent a cabin. After getting the keys, i promptly passed out for two hours, woke up, and went to dinner where by chance I joined five other pilgrims. We traded stories and our blogs à la Canterbury Tales. Curiously, one included the powerful experience of reading Christ’s words, « Je suis le chemin » while traversing over a treacherous part of the Pyrenees.